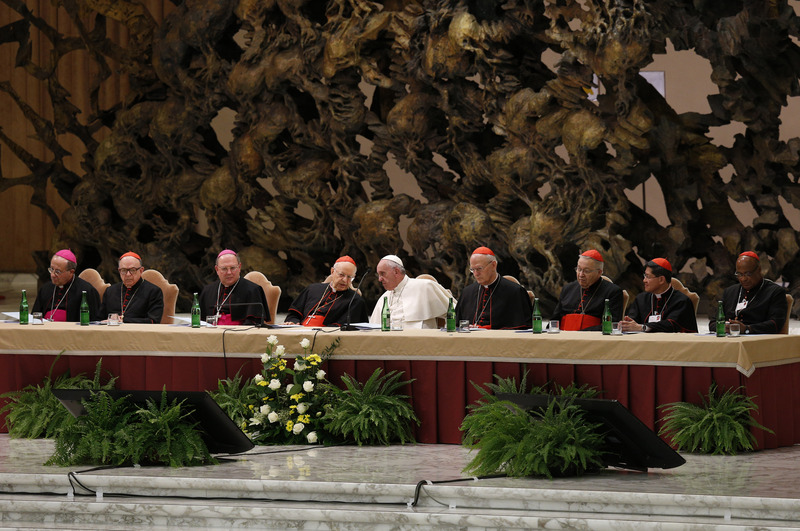 Where Is the Synod heading? Pope Francis believes in starting processes that can develop over time, and are not caught in the trap of having to get rapid results or immediate solutions. The Synod on the Family is a case in point. Articulated in two stages and now drawing to a close, it has been a process of listening, discussing and discerning how the Catholic Church in the 21st century can reaffirm the family and show God’s mercy and love to people in various kinds of family situations and difficulties today. The synod is an integral part of “the synodal church” that Francis, following the Second Vatican Council, is working actively to develop and promote worldwide. And while this three week-long assembly ends on Sunday, October 25, when the pope concelebrates mass with the synod fathers, the synodal process of listening, discussing and discerning is likely to continue in the local churches in the coming years, and that could lead to significant changes, particularly if Francis pushes forward with the decentralization he spoke about last Saturday, October 17. The synod fathers conclude their work next Saturday evening, October 24, by voting on the assembly’s final document. We don’t know for certain what the final result will be, but some things appear to be clear already. As Pope Francis has stated on more than one occasion, even before the synod began, there will be no change in the church’s doctrine, no change in her teaching on marriage and the family. That was not up for discussion. Indeed, that doctrine is likely to be re-affirmed in the synod’s final document. One of the main questions that has been under discussion, however, is whether the church’s discipline can change in this whole field, and if so in what ways. The distinction between doctrine and disciple is one on which not all fathers are agreed, as Canada’s Archbishop Paul-André Durocher told the press at a briefing in the Vatican. In actual fact several synod fathers have hotly contested the existence of such a distinction, among them Archbishop Stanislaw Gadecki, the president of the Polish Bishops Conference. The distinction between doctrine and discipline is a most important one, however, and if recognized by the synod it could open new horizons for the church’s pastoral practice. If the synod cannot reach consensus on this matter in these final days, the pope may have to rule on it in due course. Another question that was discussed in some depth in the (language) working groups is the relation between mercy and truth, mercy and justice, and what consequences this can have for pastoral ministry. As I write, it’s still not clear whether the synod fathers have been able to reach a consensus, though the chances seem good given that the fathers in the German language group—which included Cardinals Kasper, Schonborn and Muller—were able to do just that, as their second group report showed. Many synod fathers read that agreement as a hopeful sign that consensus too could be possible in the final document. That certainly would be progress. He should know because he’s one of the 13 rapporteurs who have had to sift through all the amendments ("modi") to the working document that were submitted by the different language groups (around 800 on Parts I and II of that text). He also spoke with knowledge of what was happening in his own language group less than 24 hours before the discussion was due to end on Part III of the working document which includes those controversial issues. In this context, it was interesting to hear Cardinal Wilfrid Fox Napier (South Africa) tell the press today, October 20—in response to a question about cohabitation—that the synod would do well to let the churches in Africa decide what is the best way to deal with the traditional practice in Africa where marriage is negotiated between families and realized in stages, with the couple living together at a certain point before the formal marriage. The delay in marrying—especially in the rural areas—is often linked to the man’s inability to come up with the dowry immediately. Napier argued that this is “cohabitation with a view to marriage,” and it’s something different to what happens in the West. He said the African churches, not the synod, are the ones best equipped to work out ways to integrate this cohabitation into Christian marriage. From the many synod fathers who spoke at the Vatican briefing, and from many others that I have spoken to, it seems evident that there is broad consensus on most of the questions that were discussed, perhaps on 90 percent or more of them. Everyone agrees on the need to present a positive, attractive vision of Christian marriage—defined as between a man and a woman. They agree on the need to use biblical language. All recognize the pressing need to develop better ways of preparing couples for marriage, and to accompany families on the journey through life. There’s widespread agreement on the urgent need to address the dramatic plight of families hit by poverty, war, armed conflict and immigration, and for the church—both in the countries of origin and in those of arrival—to give much greater assistance to migrants. The synod fathers agree too on the need to encourage families to be "missionary," reaching out to others to bring them the Good News. They recognize the need for the church to develop a new language with which to communicate her message to families. Three buzz words have been repeated again and again at the synod: accompaniment, reconciliation and inclusion. It will be interesting to see how the final document expresses what all this means in concrete terms for people living in very different family situations, starting with the single-parent family. Above all, many will be scrutinizing the final document to see if it reflects a new pastoral approach by the church toward the family, a new way of responding to the different family situations in which people are living. What we don’t know is the content of the amendments—probably hundreds of them—that the 13 groups have submitted to the 10-man commission that is drafting the final document. Those amendments will help define that text. The synod, which is a consultative body to the pope, will vote on the final document on Saturday afternoon, October 24. It will then hand over the text to Pope Francis. He is expected to give the green light for its immediate publication. At this point, the key thing to watch for is whether the synod’s final document closes doors by coming out in black and white terms on the three controversial questions mentioned above or whether it will leave the doors open in a way that makes it possible for Pope Francis to decide the way forward on these and many other issues in a magisterial document at some future date. Everyone is waiting to see what he will say at the conclusion of the synod on Saturday evening, October 24, after the final vote has been cast.